General Lamps Blog - E10, E12 and E14 bulbs – what’s the difference? E10, E12 and E14 bulbs – what’s the difference? When you shop for bulbs online and you’re comparing a product image on the computer screen to the old bulb you have in your hand, it’s hard to tell if the screw or bayonet cap is the right size. This is made even worse with small screw caps where there are only a few millimetres difference between the sizes. But don’t worry, once you know what the cap types mean, and with the aid of your trusty tape measure or ruler, you can be confident you’ll order the right bulb every time. All of our product pages show the cap fitting in the product specification. Can also be referred to as MES, Miniature Edison Screw. These are commonly found in old chandeliers and so the bulbs designed to fit e10 lamp holders tend to more decorative in appearance to suit the light fitting. 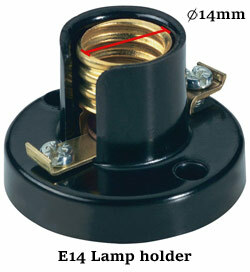 You will also find bulbs with E10 caps in miniature lamp applications and indicating panels. Is a size more commonly found in America and is used in old or imported candelabra fittings. It is the least common of the screw sizes so is unlikely to be stocked in your local supermarket. Luckily you can still find a good range online from specialist bulb suppliers (just like us!). Or SES standing for Small Edison Screw is a very common size used throughout Europe and the UK. It is found in many types of small light fittings around the home from bedside table lamps to wall lights and chandeliers. Many shapes of bulb are available with an E14 cap including Candles, Golf balls, small reflector spot lights and small decorative filament bulbs. Be sure to know what shape will best suit your fitting. Known as ES for Edison Screw. This is the standard screw size used in most large mains voltage light fittings. It’s uncommon for this size to be used in a delicate chandelier or an old fitting but there are always exceptions. Again a wide range of shapes will be available for bulbs with an E27 cap.